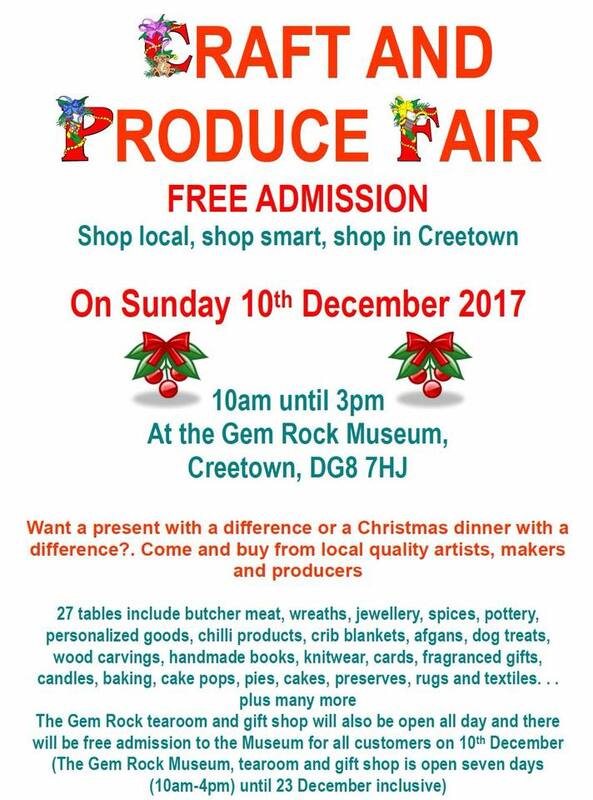 Creetown Craft and Produce Fair will be running this Sunday 10th December in the Gem Rock Museum 10am – 3pm. The fair will host a large selection of high quality locally produced crafts, arts, meats, preserves. Also spices, pottery, jewellery, knitwear, baking, pies, cakes, wood carvings, dog treats, handmade books, wreaths, personalised goods, rugs, textiles and candles. There will be something for everyone at the Creetown Craft and Produce Fair. Whether you are looking for a gift for a special loved one, something tasty for Christmas day or want to treat yourself, you’re sure to find something you love. What’s more, you’ll be supporting local producers, artists and craft makers. The Gem Rock Museum tearoom and gift shop will be open all day, plus there will be free admission into the museum. The museum collection contains many fine and rare examples of crystals found in Britain. They are displayed alongside many other colourful specimens from around the world with unusual items such as the 4.5 billion year old, three kilogram meteorite, the fossilised egg and dung of a dinosaur! There is a unique Crystal Cave with crystals and minerals displayed in a realistic cave setting and a professor’s study with an audio visual presentation, in addition to the jam-packed gift shop and scrumptious tearoom! For more information, contact 01671 820654 or find us on facebook! Thanks to funding from the lottery, we are pleased to be able to advertise for two new posts; a full time Project Worker and a part time Marketing Assistant. Both posts are initially for a 3 year fixed term contract, with a possible extension, dependent on future funding. Please see the advertisements below and do contact us for further information. Depending of levels of interest, computer classes could be running in Creetown later this month. Dumfries and Galloway Council, working in partnership with Creetown Initiative, are intending to run computer workshops in the Waverley Hall. Workshops would include Beginners iPad, More Advanced iPad, Android tablet and Windows 10. Windows 10 is the most powerful operating system that Microsoft has ever made, but it’s also the most complex. Many users are finding all the added features a bit like navigating a minefield and our computer classes aim to eradicate the confusion and help make your desktop experience pleasurable. 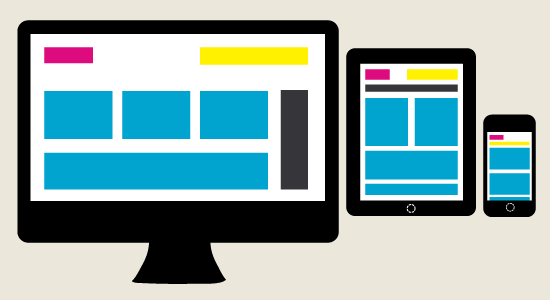 Similarly, all forms of tablets can seem daunting to use, especially for those not used to touch screen technology and apps, but the benefits of these devises can be far reaching. Whether you have recently bought an iPad or Android tablet, are thinking of purchasing one or don’t really understand what they are, the beginners course is for you. If you can perform basic functions on your tablet, but want to know a little more, try out our more advanced course. Ipads and tablets may be provided or learners can bring along their own device. A nominal fee will be charged to cover the cost of the hall. 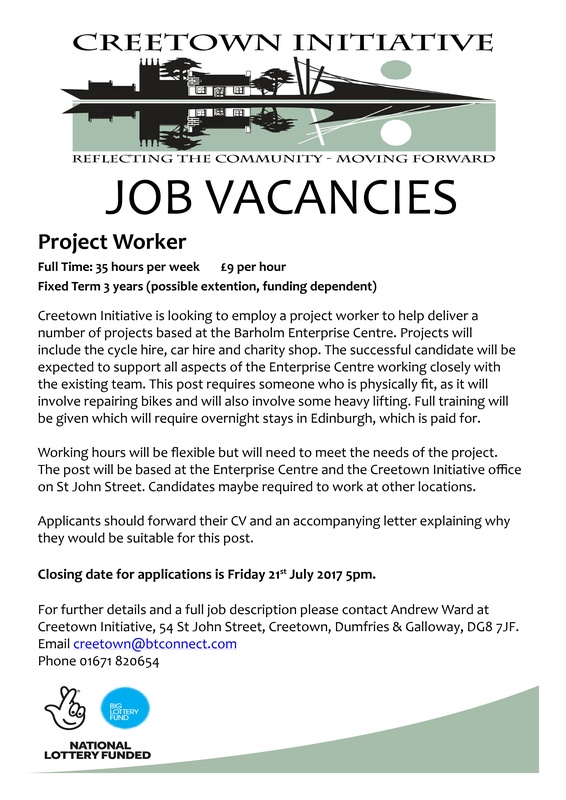 To establish the level of interest, please contact Creetown Initiative on 01671 820654 or amydeewatson@gmail.com. Keep up to date with this project and others by liking and following our Facebook page. Anybody local love watching ‘Strictly’ on a Saturday night and wish they could learn the dances? 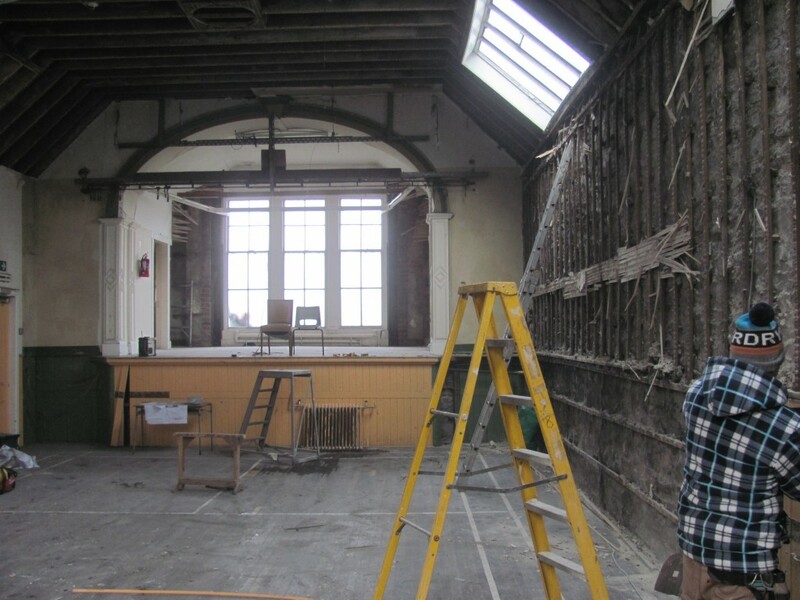 Well, if there is enough interest, adult Ballroom, Latin and Salsa dance classes could be coming to the newly refurbished Creetown Waverley Hall! 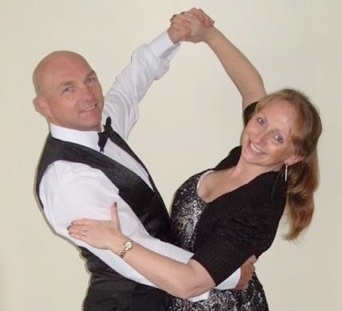 Lead by qualified dancers of the British Association of Teachers of Dancing, Steph and Angie Bishop of Galloway Dance, the classes would be for beginners and would have lots of variety, including the Social Foxtrot, Cha Cha Cha, Waltz, Jive, Quickstep and Salsa. The proposed time for the dance classes is Sunday afternoons or evenings beginning at the end of October and the cost of a 6 week course would be £30 per person if paid on week 1 or £6 per person per night. For more information, or to register your interest, contact Steph and Angie Bishop on 01671 401107 or gallowaydance@btinternet.com, or visit their website, www.gallowaydance.co.uk. What a great activity/club it would be for the village! Our youth work staff are able to run free activities during the summer holidays for young people aged 4 – 17, thanks to funding from Children in Need and BIG Lottery Young Start fund. Gymnastics tutor Kendall, is providing gymnastics training on different disciplines of the sport, including vault, beam and floor, which will take place in the newly refurbished Waverley Hall. The new craze of bubble football, is being run in the park by a company coming down from Glasgow for the day, but due to their health and safety restrictions, this activity is only available for children aged 8 and over. 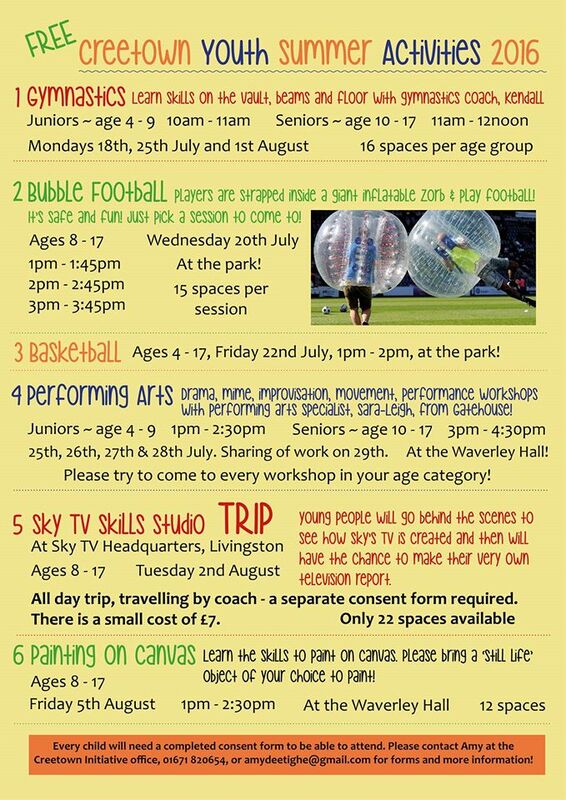 We are also running a basketball session, a painting session with an experienced artist and performing arts tutor, Sara-Leigh is providing a week of performing arts workshops in the Waverley Hall for young people interested in drama, mime, performance and improvisation skills. There is also a fantastic trip for young people aged 8 – 17 to go to the Sky TV studio headquarters in Livingstone to take part in a hands on skills workshop. We will travel by coach and young people will have the chance to see how TV is created and then to create their own TV report, using studio equipment. There is a small charge of £7 per child, to cover meal costs on the return journey from Livingstone. All local children are very welcome to attend, whether you have been to any of our activities before or not! Every child participating in any or all of the activities will require a completed, signed parental consent form. Forms and flyers can be collected from the Creetown Initiative office. Phone 01671 820654 or email amydeetighe@gmail.com for more information. 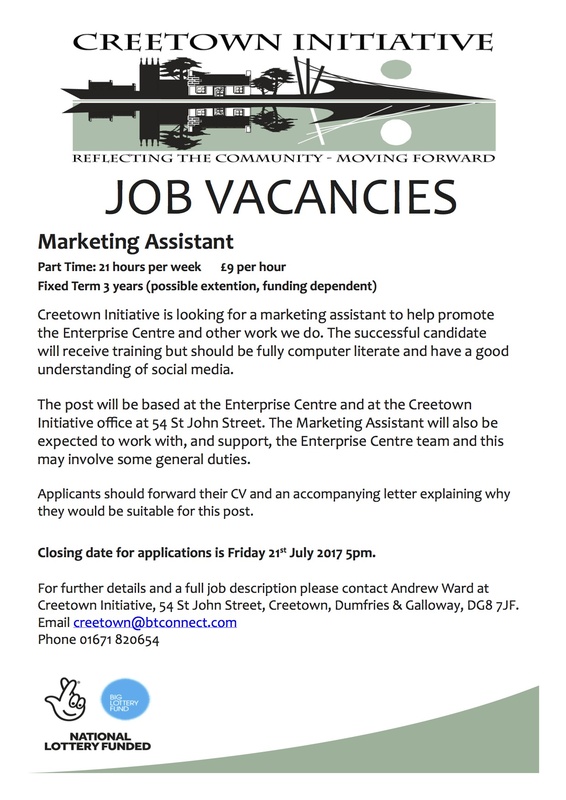 Please hand them in to Amy at the Creetown Initiative office as soon as possible, as some activities have limited spaces. 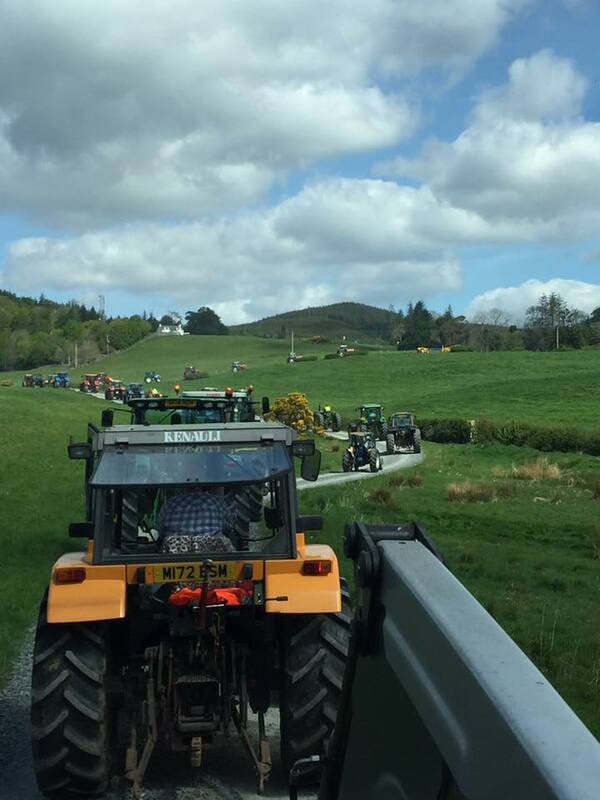 ‘Tractorrific’ success for the Creetown Charity Tractor Run! On a beautiful spring morning on Sunday 15th May, 66 tractors of all ages and sizes and their drivers gathered at the WhiskyBroker yard in Creetown to take part in a charity tractor run, in aid of Coeliac UK. A cause close to his heart, organiser Stewart Birse of Drumraik Farm, Creetown, wanted to mark his 50th Birthday by raising funds and awareness of Coeliac disease; a condition that affects both his mother and sister. Well, he has achieved that and more, by raising over £3500, with donations still coming in. Drivers ranged in age from 17 to over 70, both men and women and some were seasonal tractor run enthusiasts , whilst others had never taken part in anything of the sort before, however everyone thoroughly enjoyed the day. The large convoy started in Creetown at 10am to a cheering crowd of supporters and travelled along the Old Military Road to Gatehouse of Fleet, through Disdow Wood and then stopped for lunch. They returned to Creetown via Gatehouse Station and Chain Road at 3pm. Clothes Swap Event in Wigtown this Saturday! Planning to visit the Wigtown Spring Festival this weekend? Make sure you take some extra time to come to our free and friendly Clothes Swap in Wigtown and attend the festival in your new outfit! 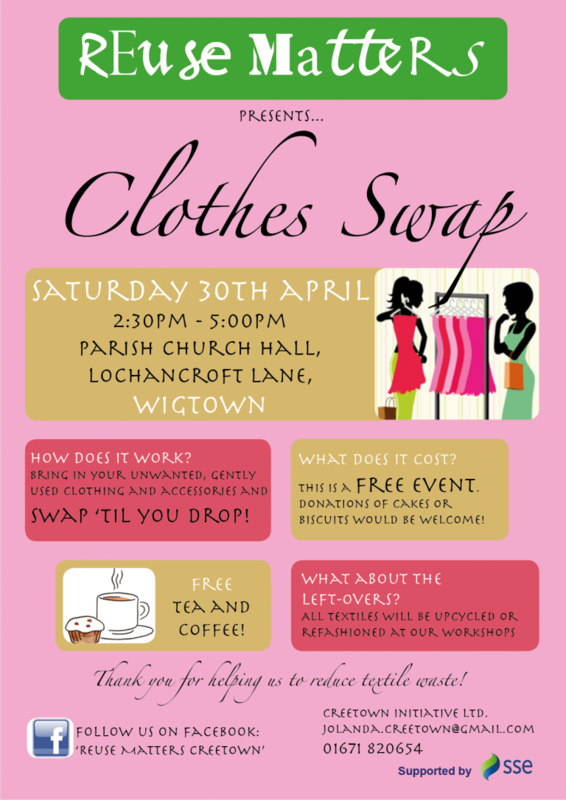 The Clothes Swap will take place at Wigtown Parish Church Hall, Lochancroft Lane 2:30pm – 5pm and there will be free tea and coffee. Donations of cakes and biscuits are most welcome! At our Clothes Swaps events, people are invited to donate their gently used, unwanted clothes and exchange them with others, free of charge. You can ‘swap ’til you drop’! All clothing and textiles that isn’t swapped, will be upcycled or refashioned at our workshops. For more information on our Reuse Matters project, please click here, or phone 01671 820654 to speak to Jolanda. Or you can ‘like’ us on Facebook to keep up to date with all our textiles upcycling events! Creetown Initiative’s youth work team will be delivering a series of film making workshops during the first week of the Easter holidays. 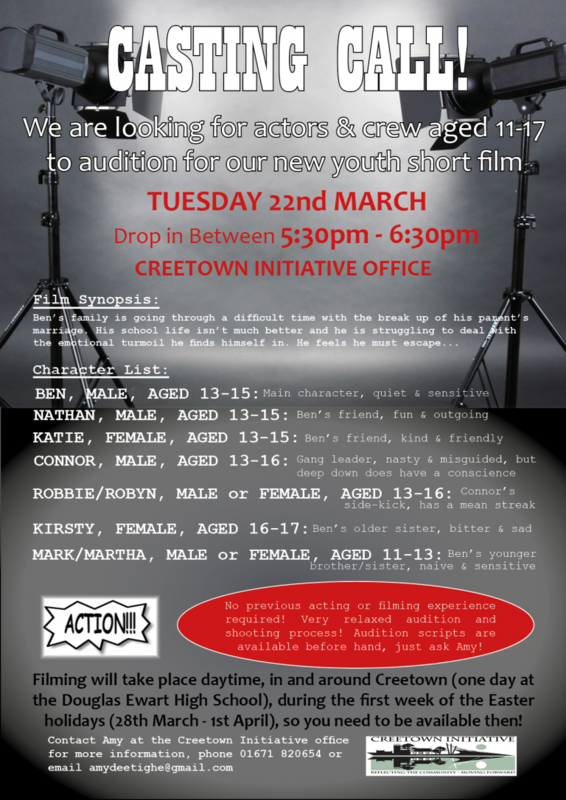 Young people aged 11 – 17 are encouraged to come along to an informal audition on Tuesday 22nd March 5:30pm – 6:30pm in the Creetown Initiative office. Local young person, Ryan Hewitson, aged 15, wrote the short film script and felt he wanted to touch on issues that can often affect young people of his age. The film charts the emotional journey of ‘Ben’, a teenager who is struggling to come to terms with the break up of his parents relationship, whilst dealing with bullying at school and is displaying signs of mild depression. The film project is open to any young person, regardless of previous acting or filming experience. We need actors, supporting actors and crew (camera, sound, lighting etc) and we have a full semi-professional film kit to shoot the film. Those who would like to be involved will need to be available during the first week of the Easter holidays. Above all, this project is meant to be fun! For more information, please contact Amy at the Initiative office, phone 01671 820654, email amydeetighe@gmail.com. 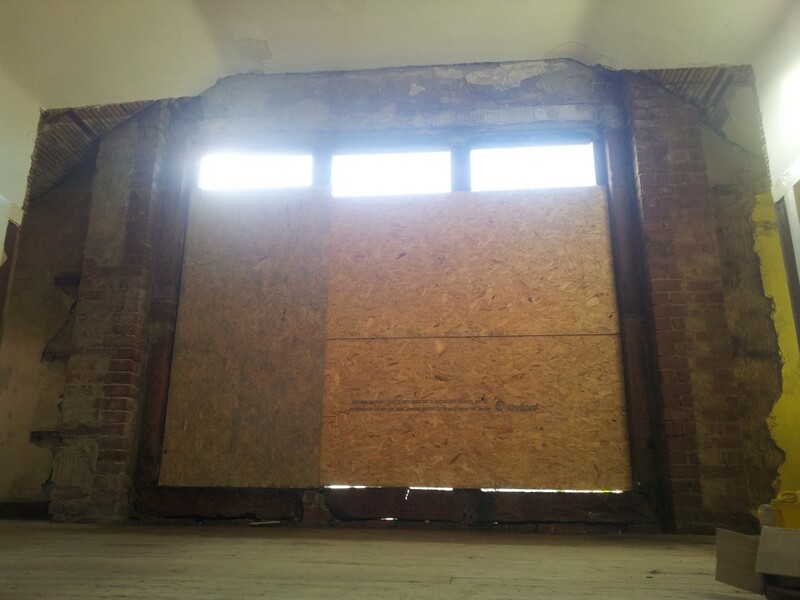 The builders are in and the refurbishment of the Waverley Hall is well underway now! Thanks to our successful applications for funding from the Scottish Government’s Town Centre Communities Capital Fund, Trusthouse Foundation, Dumfries and Galloway Council and a few other generous trusts, our community will soon have a brand new facility to use. 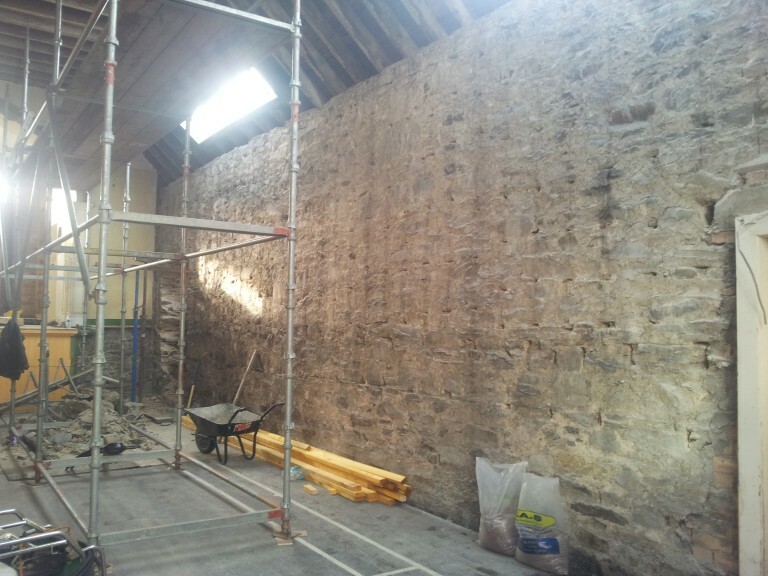 The building works so far have revealed the original proscenium arch over the stage and the walls have been stripped back to the original stone. In time, new insulation and plaster boarding will be put in place, to make the hall a nice, warm environment for everyone. 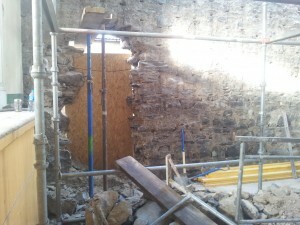 The new partition wall in the old kitchen is now in place, which will divide the kitchen from the new disabled toilet. A new fire exit door is being installed next to the stage and the old one at the end of the corridor (next to the steps leading up to the stage) is being removed and blocked in. Keep checking back for more updates of the capital works! ‘Nerf War’ Fun for Newton Stewart Youth Clubs! The old gymnasium at the Douglas Ewart High School was transformed into a manic game zone on Monday night! 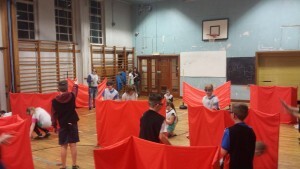 35 members of the Newton Stewart Junior Youth Club took part in the fun, safe, nerf wars games and delighted in ‘shooting’ their comrades and leaders! Nerf guns are a popular children’s toy that fire small foam darts that attach to vests to win games and earn points. The session was delivered by portable activity event specialists, Activity Delivered, who are based in Edinburgh. Whilst these games are fun, they are also a great opportunity to encourage team working skills, strategic thinking and to build fitness, as there is lots of running around. The Newton Stewart Senior Youth Club and Creetown Senior Youth Club will also be participating in their own games on Wednesday and Thursday nights this week. Creetown Initiative’s youth work team have been able to organise this event due to activity and events funding from BIG Lottery Young Start Fund and Children in Need. Without this funding, events and activities such as those provided by Activity Delivered and other companies outside of Dumfries and Galloway, would not be possible for our rurally isolated young people.